Scandal is back and ready to be psychotic again. Here’s what’s up in the world of TV for Thursday, October 3. All times are Eastern. 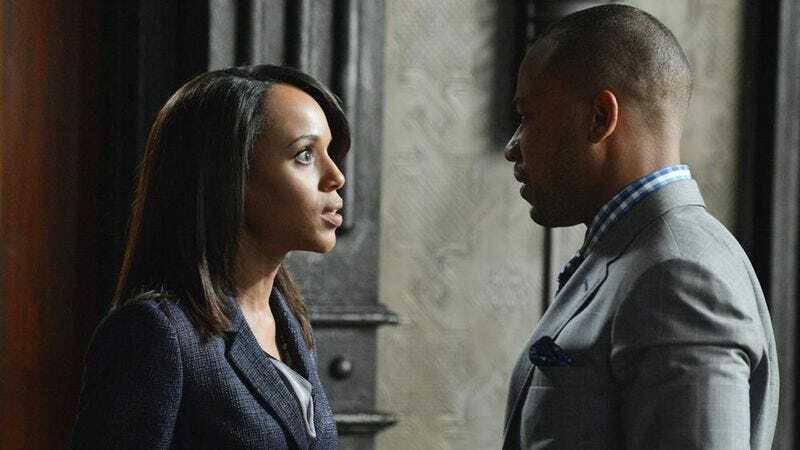 Scandal (ABC, 10 p.m.): Oh, God, it’s back. A summer after Olivia Pope’s life went totally haywire and the series hit a massive reset button in a futile attempt to make the show sound less batshit insane, Scandal returns to us with promises of being even more breakneck and insane for season three. Olivia’s biggest secret has hit the mainstream media and we’ve just met her father, which means pretty much anything could happen. Will it be able to sustain its feverish, joyful psychosis? Or will it burn out in a blaze of primetime glory? Or, fantastically, both? Tune in to find out. In the meantime, Sonia Saraiya is wearing a white hat. The Big Bang Theory (CBS, 8 p.m.): Raj organizes a scavenger hunt that turns “cutthroat,” which sounds like the reason we flunked out of Girl Scouts three years running. As it turns out, there are no knives in Girl Scouts! Just cookies. Oliver Sava wants cookies. Like right now. Parks And Recreation (NBC, 8 p.m.): On tonight’s Parks our favorite Pawnee citizens make the dreaded journey to Eagleton to spar with a city councilwoman, and Ann takes April to vet school. We can see April as a vet. That’s a good call. Hey, have we told you guys we want to adopt a dog? Do you think we’d make good dog parents? What do you think, a poodle? Or a German shepherd? It can wear an A.V. Club bib and we can name it “A-plus.” Alasdair Wilkins is not amused. Glee (Fox, 9 p.m.): The Beatles travesty continues with part two of the fifth season premiere. If you weren’t moved by Klaine’s proposal smooching or the return of Mercedes, maybe you’ll be swayed by a… Tina-centric storyline? In which she gets nominated for prom queen, and then lets the fame go to her head! Brandon Nowalk is a sucker for prom storylines, but that’s because he was prom queen himself, once. The Michael J. Fox Show (NBC, 9 p.m.): Tonight’s episode is called “Art,” which raises all kinds of questions. Like: Is it itself art, or is it about art? Is it a commentary on art? Or is there a person in it whose name is Art? Art Garfunkel is in it, isn’t he? Robert David Sullivan knows this is how rumors get started. Elementary (CBS, 10 p.m.): Holmes has to solve a mathematician’s death by working out an unfinished equation, which sounds exactly like the real-world application for algebra that we were convinced didn’t exist. At least Myles McNutt listened during math class. Parenthood (NBC, 10 p.m.): Last week, Kristina Braverman decided to run for mayor. This week, she and Adam begin to slog through campaign work, as Jasmine and Crosby grapple with their newborn’s crying. Parenthood is making both running for mayor and having an infant sound like kind of a downer, which is harshing Todd VanDerWerff’s jive. NTSF: SD: SUV:: (Adult Swim, 12:30 a.m.): “How Piper Got Her Groove Initially” promises to tackle the question of how Piper Perabo got her Groove Armada tattoo, the first time, I mean. Kevin MacFarland has seen Coyote Ugly eight times. Star Trek: Deep Space Nine (11 a.m.): Worf and Dax get married? Worf and Dax get married! Weddings are great! Drinks all around? Wait, does this mean Zack Handlen has to make a toast? He didn’t have remarks prepared, but, uh… well. he’ll think of something. Gilmore Girls (1 p.m.): “Dear Emily And Richard” puts us through a flashback as we see how it came to be that Lorelai Gilmore had a baby girl at 16 and decided to go it alone. We will cry. In fact, we are already crying. Don’t worry, David Sims has a kleenex. Scandal: The Secret Is Out (ABC, 8 p.m.): No really, in anticipation of a huge season premiere and in an effort to grab any stray Grey’s Anatomy fans, ABC is airing a clip show covering the first two seasons, narrated by the show’s own Joshua Malina. They might just rename Thursday nights on ABC to The Shonda Rhimes Happy Fun Night. The Millers (CBS, 8:30 p.m.): Will Arnett, Margo Martindale, and Beau Bridges are the Millers, a dysfunctional family with problems just like yours, except that they’re much, much prettier. Todd VanDerWerff pronounced it “okay, even with all the fart jokes,” which is a goddamn triumph in this economy. Grey’s Anatomy (ABC, 9 p.m.): Meredith and Derek are apparently staying home with their newborn son, which, WAIT A MINUTE, BABY MCDREAMY? Sean Saves The World (NBC, 9 p.m.): In the continuing tradition of pilots we’re not excited about debuting tonight, Sean Hayes tries to handle his meddling family while also being gay, or something! Todd VanDerWerff doesn’t think it’s very good, but you know, he’s a big downer about everything. The Man With The Iron Fists (HBO, 8:30 p.m.): We haven’t heard of this movie, but it features a man with iron fists, and also, RZA wrote it and is in it? Also Lucy Liu? And Russell Crowe! Oh my goodness gracious we have to set our DVRs right now, hold on. The Private Lives Of Elizabeth And Essex (TCM, 8 p.m.): Okay, we haven’t seen this one either, or really heard of it (what did you think you were reading, the film section?!) but this sounds like it’s probably really cool? It was made in 1939 and Bette Davis and Olivia de Havilland and Errol Flynn are in it which are all names that we have seen referenced in relevant Looney Tunes bits from this time period. We are very smart and cultured, indeed. MLB Playoffs, Game 1: Dodgers At Braves (ESPN, 7:30 p.m.): The Dodgers, they used to be in Brooklyn, and the Braves, they were in that movie from Ireland! Right? No? Wait, aren’t we in film still? The League (Wednesday): Taco gets a truck, but it’s not a taco truck, it’s Taco’s Truck. Also, he thinks apostrophes are called “uppercase commas.” The man is a hero. Pilot Viruet is trying to play along with her own fantasy football league, but she’s put too many lowercase commas on the field.